The surgical approach using traditional means can provide wide range of success from 40 to 90%. Recent advances in endodontic surgical armamentarium have been mentioned to elevate the success rate to 96.8%. However, Zuolo et al. stated that these favorable post-surgical outcomes are possibly affected by the site of surgery as reported to be 97% in maxillary anterior teeth compared to 85% in posterior teeth, which is characteristic for complex radicular anatomy. Hermetic apical seal is a fundamental prerequisite for successful endodontic surgery. The possibility of achieving it with or without retrograde filling is controversial. , This case report demonstrates the favorable clinical outcomes that can be achieved following accurate judgment for the indication of retrograde filling. A healthy, 13-year-old male patient reported with a chief complaint of labial and palatal swelling in relation to his previously traumatized maxillary anterior teeth. The clinical and radiographic examinations revealed large, well-defined periapical radiolucency related to his coronally fractured and discolored maxillary left central incisor, which exhibited blunderbuss root apex [Figure 1]a-c. Figure 1: (a) Maxillary occlusal radiograph showing the buccolingual extension of the lesion. (b) Root diversion of the lateral incisor (double white arrow) was observed. (c) The lesion overlapped the lateral incisor and canine. (d) Obturation using lateral compaction technique. (e) After 16 months. (f) The lateral incisor regained its normal horizontal alignment and the canine continued root formation. (g) After 26 months. (h) Periapical radiograph showing well-defined radiolucent area related to the maxillary right incisors. (i) Obturation by lateral compaction technique. (j) After 6 months. (k) After 40 months. Even though the maxillary lateral incisor was vital, the endodontic treatment of both incisors was scheduled due to the high possibility of its vascular supply being compromised while performing the curettage. All endodontic treatment procedures were conducted under magnification (loupes 2.5×, Heine, Herrsching, Germany) and accessory illumination (XHL, Heine, Herrsching, Germany). After teeth isolation and access cavity preparation, the cystic fluid was drained. The mechanical instrumentation was performed after the cystic fluid was completely evacuated in the third visit. A custom-made master cone was utilized to the maxillary central incisor, and the teeth were obturated [Figure 1]d. Following this, the root was resected and a retrograde cavity was conventionally prepared using a small round bur. Conventional glass ionomer cement (Ionogem, Dental composite Ltd., Kent, United Kingdom) was mixed and condensed into the prepared retrograde cavity. The patient was then referred for restorative treatment. 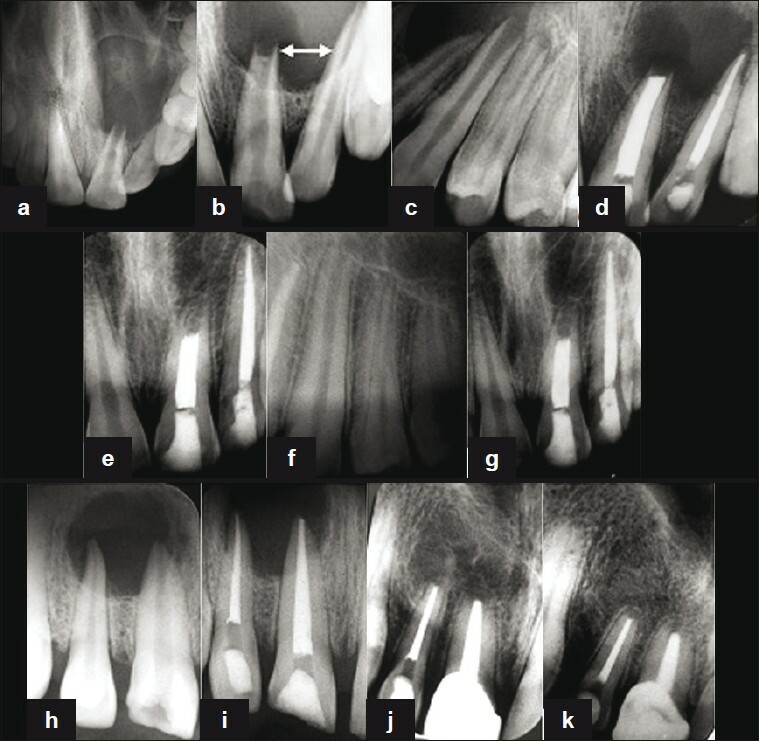 Follow-up radiographs till 26 months showed satisfactory clinical outcomes [Figure 1]e-g.
A healthy, 18-year-old male patient, with previous history of trauma, reported with a complaint of labial swelling in relation to his maxillary right anterior teeth. The clinical and radiographic examinations revealed a well-defined periapical radiolucent area in relation to his maxillary right incisors, in which the maxillary central incisor was coronally fractured and discolored, and the lateral incisor was diagnosed non-vital after performing pulp vitality test [Figure 1]h. Like the previous case and with the aid of assisted magnification and accessory illumination, the cystic fluid was drained and both incisors were endodontically treated [Figure 1]i, followed by root-end resection and cold burnishing. The patient was then referred for restorative treatment. Follow-up radiographs till 40 months showed optimal bone healing along with regaining the lamina dura, regardless of the inadequate coronal filling depth in the maxillary lateral incisor [Figure 1]j and k.
Despite the psychological and communicational problems associated with dental traumatic injuries, some patients do not consider this issue unless a swelling or severe pain is evoked. Large cyst-like periapical lesions can be one of these undesirable pathological outcomes that can drastically change the treatment plan to more complex procedures. Non-surgical treatment has been introduced for managing such lesions. However, this treatment option requires multiple visits for intracanal medicament applications before permanent root canal filling. This may not be suitable for patients who request limited number of visits due to time constraints. In the first case, the difficulty to perform an optimal apical mechanical preparation followed by a three-dimensional orthograde obturation necessitated a retrograde filling. Conventional glass ionomer cements are widely used in clinical dentistry due to their biocompatibility, bonding to hard tissues and high dimensional stability, which make them suitable as a root-end filling material. In the second case, the retrograde filling was presumed not to be required as the root canal was able to be thoroughly instrumented and obturated as the root was completely formed, and the root apex anatomy was not significantly affected by the lesion. Therefore, it can be concluded that if the root canal space can be mechanically instrumented and obturated adequately, the source of irritants will be effectively eliminated, making the placement of a retrograde filling not necessary. 1. Kim S, Kratchman S. Modern endodontic surgery concepts and practice: A review. J Endod 2006;32:601-23. 2. Zuolo ML, Ferreira MO, Gutmann JL. Prognosis in periradicular surgery: A clinical prospective study. Int Endod J 2000;33:91-8. 3. Rahbaran S, Gilthorpe MS, Harrison SD, Gulabivala K. Comparison of clinical outcome of periapical surgery in endodontic and oral surgery units of a teaching dental hospital: A retrospective study. Oral Surg Oral Med Oral Pathol Oral Radiol Endod 2001;91:700-9. 4. Rapp EL, Brown CE Jr, Newton CW. An analysis of success and failure of apicoectomies. J Endod 1991;17:508-12. 5. Çaliºkan MK. Prognosis of large cyst-like periapical lesions following nonsurgical root canal treatment: A clinical review. Int Endod J 2004;37:408-16.
pawar, a. and kokate, s. and shah, r.